When you have been working on a skill for a while, it can be really frustrating to think that your students’ skills are STILL not emerging. What do you do when your students’ skills are still not emerging? You’ve tried EVERYTHING it seems. You are looking for a new angle. If you aren’t seeing the amount of progress you want to see from your students, watch this Vlog to find out what you can do when your students’ skills are still not emerging. 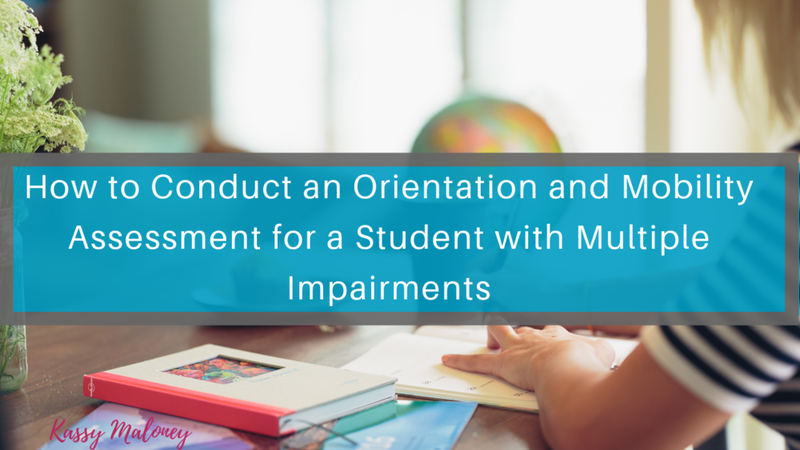 Last summer, I did the most daring thing an Orientation and Mobility Specialist could do. I signed up to teach an elementary summer school class. For two sets of one week sessions, I was given a set of 8 brand-new-to-me students, aging from 7 to 8 years in age. The objective was to help them learn about their worlds in a fun, motivating, and impactful way. Kind of like O&M 101 camp. On Day 1, we learned how to go grocery shopping. I had made 8 copies of light-weight maps, both tactile and high-contrast print versions. “How did you get this job at the International Orientation and Mobility Online Symposium?”, one of our planning committee members asked the other day. I shrugged, not knowing how to answer her. “I made it up!” I said. It has been a long time since we got to chat about what I am up to now, so I figured we could sit down together, grab a cup of decaf coffee or sparkling water, and chat. Academic performance is at the heart of every piece of data that our administrators collect. We know it's not their fault. They need to prove that we are doing our jobs. But our job, although arguably the most important educational component to any student/ client/ consumer's curriculum, is not always seen as the pivotal piece. Often, as related service staff for a low incidence population, our bosses don't even know what we do. How can you help empower your students to travel more independently? You and your student get out to the community. You start your lesson. They are going to travel a route using their iPod or iPad, just like you practiced at their school. Only this time, they are going to actually travel the route and use the iPod/iPad at the same time! But the device? It won't work. You can't get the map to pull up out in the community because there is no wifi. You change your lesson plan, of course. But, you didn't have to go through that strife to begin with. Instead of having to change your plans, there are ways to hook up your non-wifi device to a device with wifi and use it out in the community. You will need a device with wifi and a little know-how. If you provide the device, I will show you how to use an ipod/ipad in an area without wifi. How to Use an iPod/iPad in an Area without Wifi. Materials needed: A device with wifi that has a personal hot spot. This can be the instructor's phone or a personal hot spot device. On your wifi-device, turn on the personal hot spot. Connect the iPod/iPad to the personal hot spot. BAM! You should be able to use the iPod/iPad out in the community. This will use the data from the wifi-device. I would make sure that the wifi-device has a data plan that can withstand the data needs of the instruction.